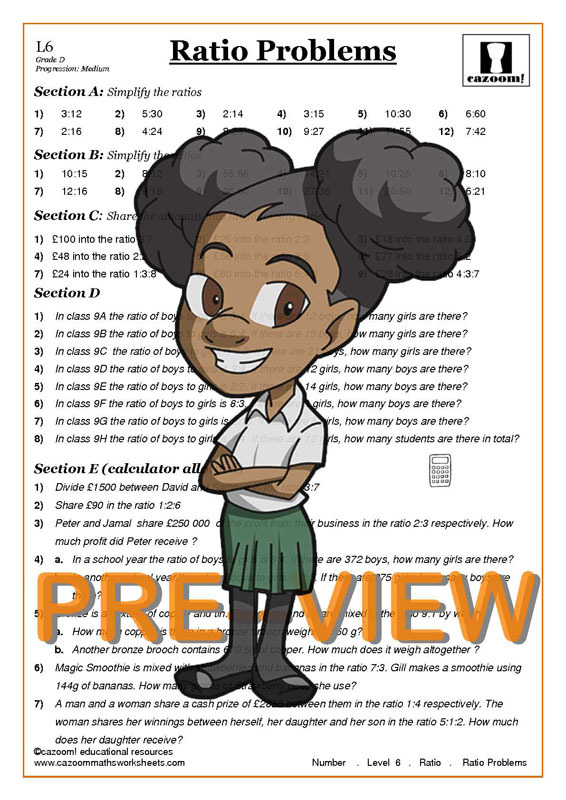 At Cazoom Maths we offer a huge range of worksheets to help children understand ratios. 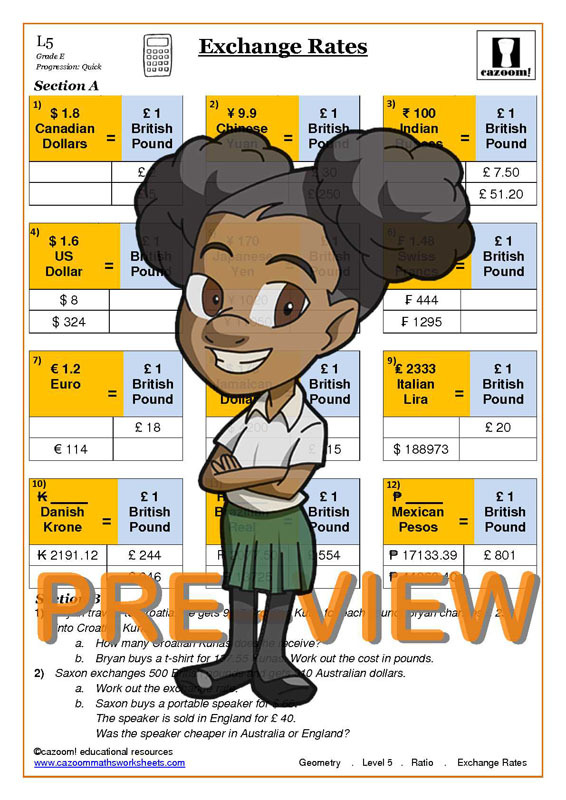 Ratios are used in many aspects of our everyday lives so our question sheets reflect that, allowing children to practice their knowledge with problems involving exchange rates and worded questions. We have ratio worksheets suitable for all levels and abilities, from simple ratios up to more complex ratio problems. 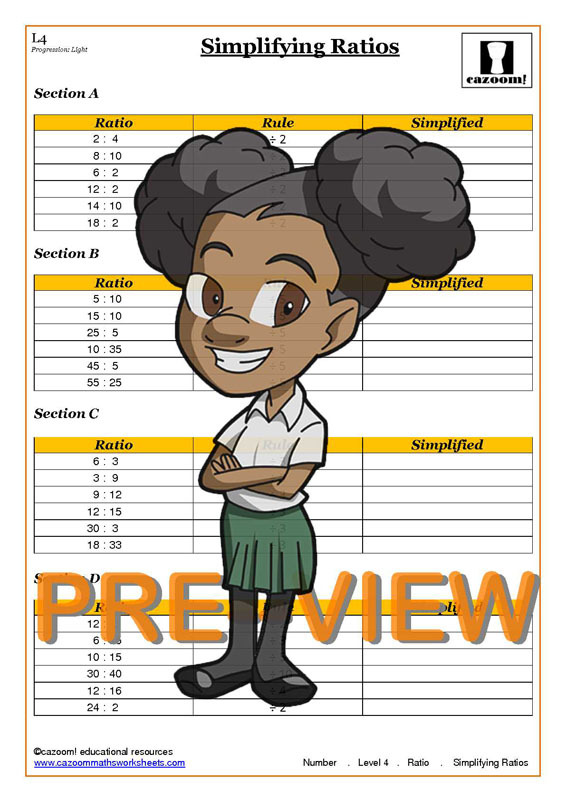 Our worksheets contain engaging activities which make the topic of ratios entertaining and enjoyable, and our ratios worksheets are all supplied with answers to check how well your child or pupil is doing. 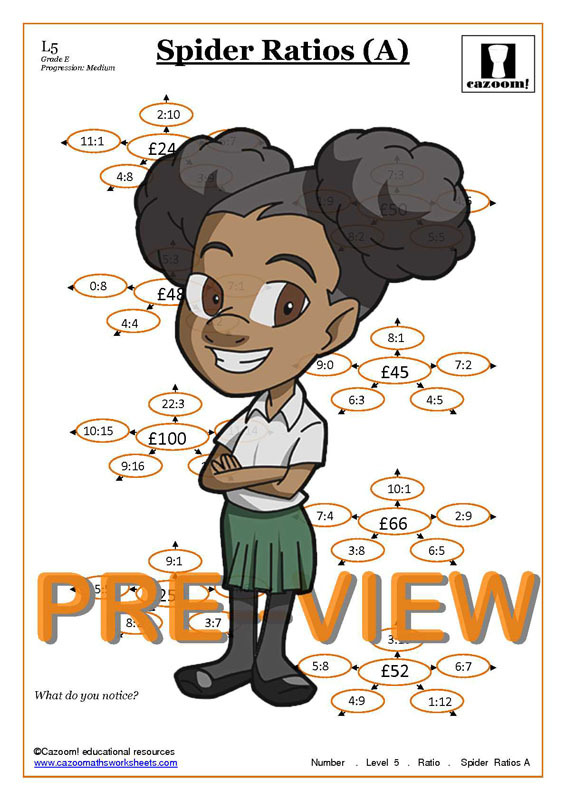 Our resources on ratios are available to download and print, and can either be used in the classroom or to support children’s learning at home. We have worksheets available to cover all aspects of ratios in the KS3 and KS4 curriculum. Our resources present all the information they need to know in a concise, easy to understand format and provide plenty of opportunities to apply their knowledge. Using Cazoom Maths will help boost students’ confidence at using ratios and prepare them for any ratio problem they might come across. Ratios are used in many aspects of our everyday lives. They tell us that two variables are proportional to each other, and are used in cooking, gambling, currency exchange and more. For this reason, it is important to make sure students have a thorough understanding of this topic by using worksheets on ratios. It is highly likely that you will be using and calculating ratios in your everyday life without even realising it. When following a recipe, the ingredients will all be proportional to each other. So if you are baking a cake the recipe advises using 100g of butter and 300g of flour, the ratio between those two ingredients is 1:3. Knowing this ratio, you can easily scale the amounts of ingredients up or down to adapt to the quantity of cake required, ensuring that the end product will still be the same quality and consistency. In scientific disciplines, particularly chemistry, ratios are extremely important. Different substances can react in different ways depending on the ratio of one to another, so it could potentially pose a safety risk if researchers did not use proper ratios. If there is too much of one substance in a mixture, toxic gases could be released, so they must understand how ratios work and measure carefully according to this proportion.